There’s a simple workaround to use Netflix in Linux, it isn’t perfect or very stable, and according to some it doesn’t always work, still, if you scroll down you can find instructions to install it. Look, I think we all should understand that Linux represents a very small portion of the desktop user base of any product, so we shouldn’t feel entitled to get all services other vastly more popular operating systems are getting, instead we should celebrate when an important service hits Linux, like Steam. One of the best developments to happen to open source, and that Linux users should embrace, is the cloud and that all decent browsers use an open source rendering engine, because its pretty much vanishing the line. Almost every single webpage in the internet works just as well in Linux as it does in Mac OS X or Windows 8. This movement into the cloud is certainly making it easier for Linux users to get any service they want without the need of a workaround. Sometimes supporting Linux, even if its in the cloud, can add to the bills of companies, specially small startups, so I understand if from time to time they can’t manage to support my favorite operating system without crippling their own business. What I can’t digest is when companies choose not to support “Linux” because they want to screw up Linux users, and Netflix is one of the most important contemporary examples. Why did I write “Linux” instead of just Linux? Because Netflix already works in Linux: It works in my Android phone, it works in ChromeOS, it works in the freaking Roku. Netflix’s CEO merely decided not to support Linux in the desktop. There’s no technological barrier or any issue with returns vs investment, the only thing Netflix needs to do is release their current plugin for ChromeOS so we can watch Netflix on any Linux distribution running Chrome (that’s it: I’m not even arguing they should support all browsers). Why would any company reduce, even by a relatively small number, the size of its potential market when doing so doesn’t save them any money (or conversely, why wouldn’t any company expand its market if doing so doesn’t cost them?). This person is the reason. 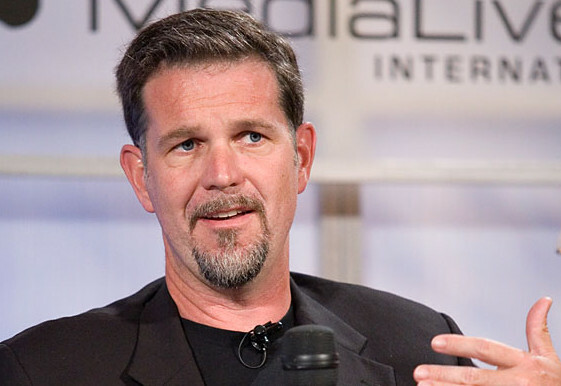 Co-founder and CEO of Netlix, Reed Hasting. His net worth is 280 million dollars and he’s a successful entrepreneur. He’s doing the world a favor by pushing the world into internet television. While Bill Gates philanthropic endeavors have all my respect and admiration, and Steve Ballmer has my admiration because very few can be wrong so many times so often and still be CEO of such an enormous company, Microsoft’s business practices were/are shady to say the least. Let me clarify that I do not hate Microsoft, I think they make a few good products, but that they achieved market dominance by engaging in absurdly anti-competitive behaviour is a fact. But while I dislike that, I tend to blame governments’ lack of ability to correctly regulate what was happening even more than I blame Microsoft, but I digress. Being in the board of Microsoft puts Reed Hasting in a position where conflict of interests arises pretty fast. Microsoft wants to use any means humanly available to maintain its dominant position in the desktop, and closing the gap between Linux and Windows is certainly not the best way to achieve it. On the other hand, Hasting surely wants as many customers as possible and adding a few million possible customers to the list without increasing expenditures is undoubtedly in Netflix’s best interests. So it all likely boils down to simple arithmetic: The projected increase in revenue for Netflix wouldn’t compensate the risk of closing the gap between Linux distributions and Windows. Since Reed Hasting left Microsoft’s board we could infer , being a tiny bit optimistic, that he did it precisely because he wants to eliminate any possible source of conflicting interests or because he doesn’t support Microsoft’s business practices. On the other hand it may not mean anything. 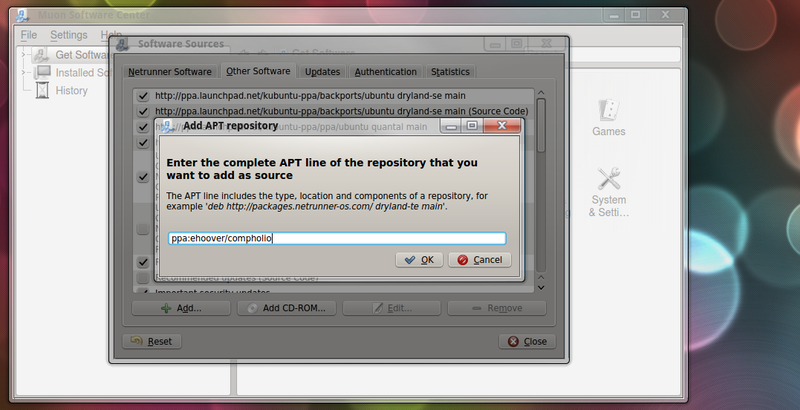 In the meantime, Linux desktop users have to choose between finding a workaround or not using Netflix at all. The second choice is justified if this annoys and you don’t want to support a company like this, but maybe you just want to watch television in your laptop on your favorite operating system. So here’s how to watch Netflix on Netrunner. First you need to add a repository you can do this graphically by going into Muon Software Center > Settings > Configure Software Sources > Other Software > Add and paste ppa:ehoover/compholio and hit ok.
Then you can open your favorite package manager (Muon Package Manager or Synaptic) and search for netflix-desktop and install it. 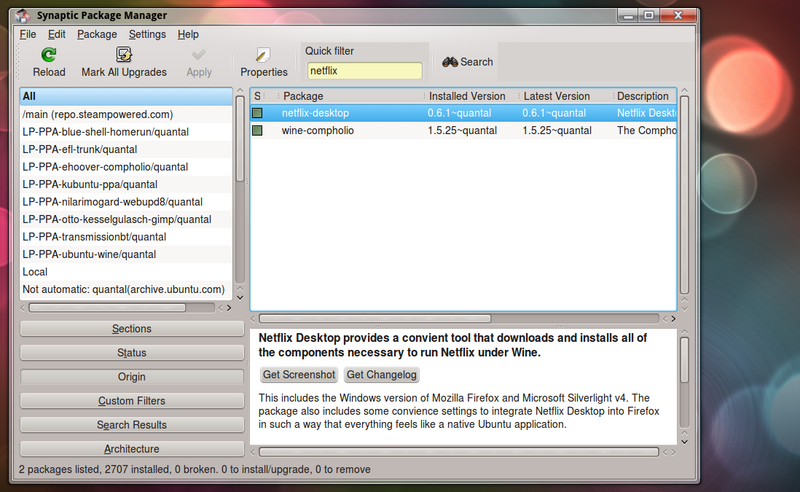 Once installed you can find it under multimedia as Netflix Desktop. It opens a special instance of Firefox and Netflix works decently, it’s a little unstable, and some report very slow framerates, although that’s not my personal experience, it may happen to some. So please, if you’re a subscriber, be sure to enjoy what you watch knowing you can workaround the interests of some companies which enjoy unfair competition. Look, I think black people represent a very small portion of the people in my country. I’m pretty sure of that, in fact. So black people shoudn’t feel entitle to get all the services other people get. Yet we should celebrate that we don’t deliberately kill the ones that are living here. I hope you got my sarcasm. Your analogy doesn’t hold. 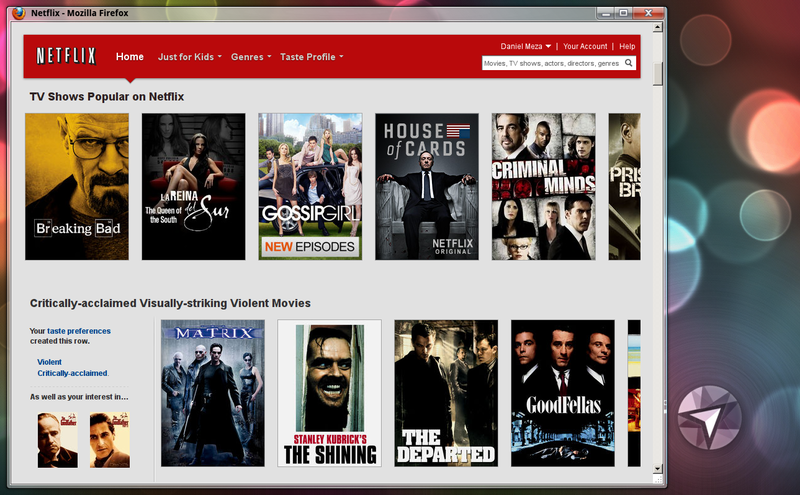 Should Netflix support any operating system there is? According to you they should, because otherwise that’s discrimination. Moreover, by charging 8 USD per month, are they discriminating against anyone that is not lucky enough to be able to afford it? Is the pizzeria close to your house discriminating against me because they won’t send their Pizza to my home in Mexico City?. You’re simply wrong. Any company has limited resources and some markets are not big enough to justify the R&D and the costs associated with maintaining it. What I do believe is that this constitutes just a bad business practice, as they can obviously offer a plugin for Linux, they already made one and deemed it viable and profitable. I’m also aware that Netflix is also under pressure by media companies because of DRM, but I still think it is not justifiable. oh, f*ck. I haven’t seen that you are from Mexico. Substitute all the black people from my post with mexicans, because in my country I haven’t seen any mexicans…So I suppose they represent a small portion of are population. Seriously, this is discrimination. (your article above, and the 2 of my comments). Cut this crap off. Edit your article. Lol, Netflix makes a product, available through certain means, with certain software. If you want the service you use it the way it is available. It is not discrimination, discrimination assumes you have a right to something, and netflix is not a right. It is a commodity. Grow up. So only 2 thirds of the operating systems currently is use are entitled to use Netflix and we should grow up? I cancelled Netflix when I switched to Linux. I don’t really miss it as I have a large dvd collection and watch You Tube docs etc. I was ready to cancel anyway as the Netflix UK selection is a little limited. I won’t support them if they don’t support me.